Successfully Added MXQ Plus Android 5.1 TV Box - Amlogic S905 Quad Core CPU, HDMI 2.0, Kodi, 4Kx2K, 4 USB Ports, SPDIF to your Shopping Cart. Get the most out of your big TV screen at home with the MXQ Plus Android 5.1 TV Box, featuring 4Kx2K decoding, pre-installed Kodi 15.2, 4 USB slots and more. Watch your media in amazing 4K quality and get access to lots of great content with the MXQ Plus TV box. Coming with Android 5.1 operating system, it will turn your TV into an entertainment hub, making navigation and media management super easy. With Kodi version 15.2 pre-installed, you will get access to loads of fun new content available in one of Kodi’s many repositories and get yourself a great media play right out of the box. 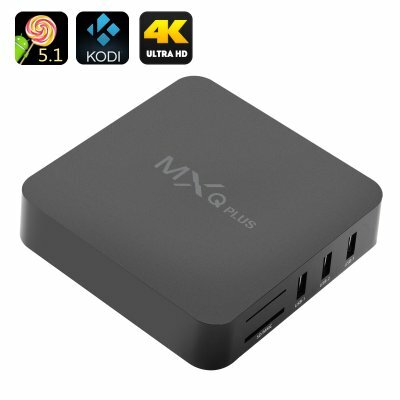 The MXQ Plus Android 5.1 TV Box comes with a 12 months warranty, brought to you by the leader in electronic devices as well as wholesale Android TV boxes..